The Niki Charitable Art Foundation welcomes educational interaction and learning through Niki’s art. There are many resources for Lesson Plans that have been published and can be purchased in the online market. 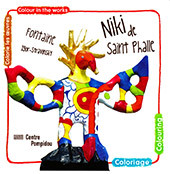 If you have a Lesson Plan you would like to share with educators all over the world, please direct all email correspondence with copyright specifications to archives@nikidesaintphalle.org and we will post it after assessing its appropriateness. Children with Inflatable Nanas at Le Paradis Fantastique, Conservatory Garden Central Park, New York, May 1968. Photo: Shunk-Kender © J. Paul Getty Trust. Comment parler de Niki St Phalle aux enfants? Mon Niki de Saint Phalle à moi !